On 01/19/2011 I was working in full uniform driving a fully marked patrol vehicle. I responded to Broadway E/E Republican St for Sgt. Aratani who on viewed a disturbance at that location at 2133 hours. V/ said he [redacted] located at 4 Broadway E. He said that S/ and came into his restaurant and had dinner. Dinner came to a total of $42. S/ and W/ gave a coupon to the restaurant but would not take the coupon. They began to argue with the V/ . V/ said the couple then left the restaurant without paying for their food. V/ stopped the two at the corner of Broadway E/E Republican St. After stopping the two S/ struck V/ with a closed fist, he then fell to the ground which ripped his pant leg and scraped his left elbow. S/ and V/ were stopped by Sgt. Aratani, from robbery, who then called for a patrol unit to respond, which I did at 2133 hours. I arrested S/ and read him his Miranda rights from a Seattle issued card. V/ said there are no hard feelings and if the two would pay for the food they ate and his pants then he would not press charges. S/ said he could pay with his credit card and would leave a generous tip for the manager to pay for his ripped pants. V/ said he would accept that. I screened the arrest and unarrest with Sgt. Aratani. I walked to the restaurant with the victim, witness and suspect. At the restaurant I watched S/ pay the bill with his credit card and leave a tip of over $70 for to pay for his pants. I then watched as V/ and S/ shook hands. I gave a business card with my name, serial number and case number on it to V/ and S/ . I then watched as S/ left the restaurant. Just a typical night out on Broadway – (another) job well done Officer Keating. I didn’t read anywhere that the coupon entitled the customer to an entirely free dining experience. Most restaurant coupons are a buy one get one. In spite of a lack of restrictions printed on them or using the coupon within the specific period covered by the restrictions, I’ve ran into trouble plenty of times using a coupon. Leaving without paying for anything is wrong. The guy going after the customer was also in the wrong. Not sure how the officer managed to negotiate that deal, but kudos. Any good public defender could have gotten the customer out of trouble on those charges. It doesn’t say what restaurant it was, but I’ve got a pretty good idea. 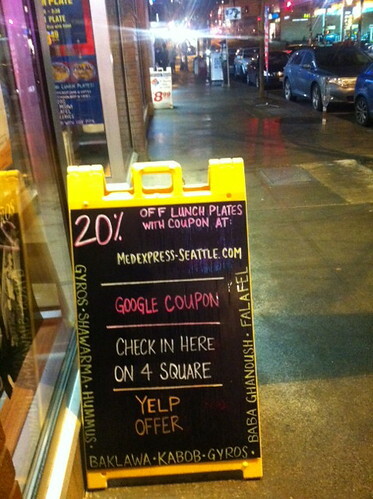 Also, we don’t know whether it was Groupon or another site, but the big ones usually have really good refund policies. Groupon quickly and without hassle refunded one of mine when I couldn’t get a response from the photographer I’d bought a package from. I mean, of course it’s a douchey move on the part of the restaurant not to honor it if the coupon was valid, but yeah, there are other ways to handle that situation. How come jseattle never misses a chance to paint a pig as an angel but when a pig does something wrong, it’s ignored? I don’t think that’s fair….There’s always been plenty of coverage of law enforcement dilemmas, protests, and responses here on CHS. I find it to be an incredibly unbiased independent news source (as opposed to The Stranger, for example). On the other hand, the fact that you refer to cops as “pigs” automatically suggests you have an agenda….Honestly, why complain about a story about a cop who’s able to reconcile a situation without violence or an arrest? Wanda, I think you’re way out of line with that comment. This blog has been very even-sided on the news it reports. Also Wanda, by referring to cops as “pigs” leads one to believe you are just a radical with an axe to grind. Some cops are pigs, most are not. Even so, they deserve some basic respect by calling them officer, regardless of how you feel. I sincerely doubt it was a “free meal for two”, and that the fine print agreed with this. I agree with CapHillMax….calling police officers “pigs” is so-1960s. You can’t possibly believe that all cops are “pigs,” can you? Why paint with such a broad brush? Most of them are professional and put their lives on the line for us on a daily basis.